For the second year in a row, the book I’ve chosen to review in celebration of Banned Books Week is about a transgender child. Last year, I wrote about the children’s biography “I Am Jazz” by Jessica Herthel and Jazz Jennings. My choice this year is “George,” a middle-grade novel by Alex Gino, which nabbed the Number Three slot on the American Library Association’s “Most Frequently Challenged List” for 2016. Here’s the summary from the inside front flap: When people look at George, they think they see a boy. But she knows she’s not a boy. She knows she’s a girl. George thinks she’ll have to keep this secret forever. Then her teacher announces that their class play is going to be “Charlotte’s Web.” George really, really, REALLY wants to play Charlotte. But the teacher says she can’t even try out for the part because she’s a boy. With the help of her best friend, Kelly, George comes up with a plan. Not just so she can be Charlotte—but so everyone can know who she is, once and for all. You might guess that there are folks who object to such a book having a place in classrooms or libraries because it “normalizes” transgenderism. To those folks, I would make one request. 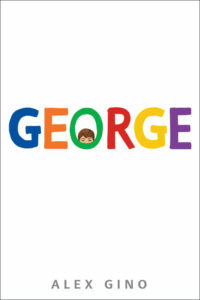 Read “George” before you decide it’s inappropriate. Or before you label someone “normal” or not. It’s an easy-to-read book that deals with an extraordinarily complex topic in a gentle and straightforward way. Told from a third-person close point of view (we’re inside George’s head but no one else’s), the author uses female pronouns when referring to George, who thinks of herself as Melissa. George’s older brother Scott, who is a stereotypical teenage boy, comes to accept George’s transgenderism more easily than their harried single mom does. But Mom comes around eventually. “Trying to be a boy is really hard,” George replies. According to WebMD, about 700,000 people in the United States live publicly as transgender. Countless others, many of them children and adolescents, struggle to keep their transgenderism a secret. Those who choose to transition from biological identity to gender identity sometimes change their clothing, hair, name and the pronouns used to identify them. Others make bigger changes, which can include taking hormones or undergoing sexual reassignment surgery. Being born with a body that doesn’t match your brain is bound to be hard row for anyone to hoe, but especially for a child. I’m thankful for authors like Alex Gino who make the issue a little easier to understand. And for all those who work to ensure that controversial books like “George” are there for those who want to read them, during Banned Books Week and always.